Does today’s culture leave you wanting something different? Do you long for the days when Michelangelo painted on the ceiling of the Sistine Chapel; when Machiavelli was putting the final touches on The Prince, and when da Vinci was jotting down invention ideas in his famous notebooks? While it may be impossible to travel back in time to the Italian Renaissance, you can at least wear an authentic Italian Renaissance dress and feel like a part of history, from an elite woman of the high class to a lowly commoner and everything in between. During the Italian Renaissance, fashion underwent a complete overhaul. Coming out of the Dark Ages, Europe suddenly had a newfound interest in fashion. The affluent people of the Renaissance were the population to see the most change in fashion. Clothing became one of the highest priorities for the wealthy class. Luxurious fabrics, such as velvet and satin, were used to make ornate, flowing clothes. Cotton, a widely available textile today, needed to be imported from India and America, making it a highly taxed fabric and a greatly sought-after material for nobility. Clothing became such a matter of import that those members of the upper echelon would often spend most of their wealth on clothing. Prosperous women and those belonging to the aristocracy would often wear an Italian Renaissance dress along with five or more additional pieces of clothing. The fabrics of these dresses were often colored with strong, dark colors. It would not be uncommon to see a deep green, purple, black, or red Italian Renaissance dress, often in velvet and in generous amounts. 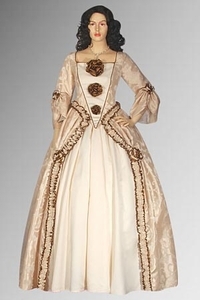 Cotton chemise tops or muslin blouses were often worn underneath the Italian Renaissance dress. Big sleeves, lace detailing, and other types of embellishment were sewn with great care into these tops. The dresses themselves were elaborately embroidered with artistic designs, and jewels were regularly sewn into dresses, giving them an even more regal appearance. Fashion did not simply stop with the Italian Renaissance dress. Just as in today’s times, accessories were a huge part of Italian Renaissance fashion. Noble women commonly wore crowns and tiaras, bejeweled with the finest stones of the day. In lieu of a crown, women would wear headdresses like crescents, kennels, gables, and brimmed caps. Extravagant jewelry was imported from exotic locales and was worn proudly, as laws were developed to limit who wore what jewelry. By finding the right Italian Renaissance dress and adorning it with the various accoutrements described above, you can relive the celebrated era known as the Italian Renaissance!